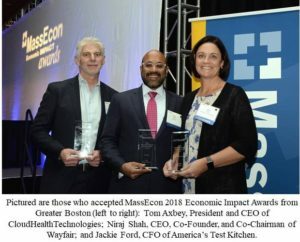 BOSTON – MassEcon, the state’s private sector partner in promoting business growth in Massachusetts, yesterday honored 15 enterprising companies from across the commonwealth with its Fifteenth Annual Team Massachusetts Economic Impact Awards, recognizing their outstanding contributions of investment, job growth, facility expansion, and community involvement. The Gold Award Winners were accepted by Alex Dixon, General Manager of MGM Springfield; Harry Kokkinis, President of Table Talk Pies Inc.; Steve Harbin, Chief Sustainability Officer of Moderna Therapeutics; Paul Asmar, Vice President for Real Estate and Properties of MilliporeSigma; and Niraj Shah, Co-Founder and CEO of Wayfair. MassEcon champions Massachusetts as the best place to start, grow, or locate a business. Bringing the public and private sectors together, we work to create a supportive culture for business, enhance job growth, promote investment in communities, and spread prosperity throughout the state. www.massecon.com.